Sawyer's iconic Free Range Folk logo has been redesigned! The new Free Range Folk Design celebrates Sawyer's independent, free spirit, the passion he puts in his original works, as well as his commitment to his organic farming roots. 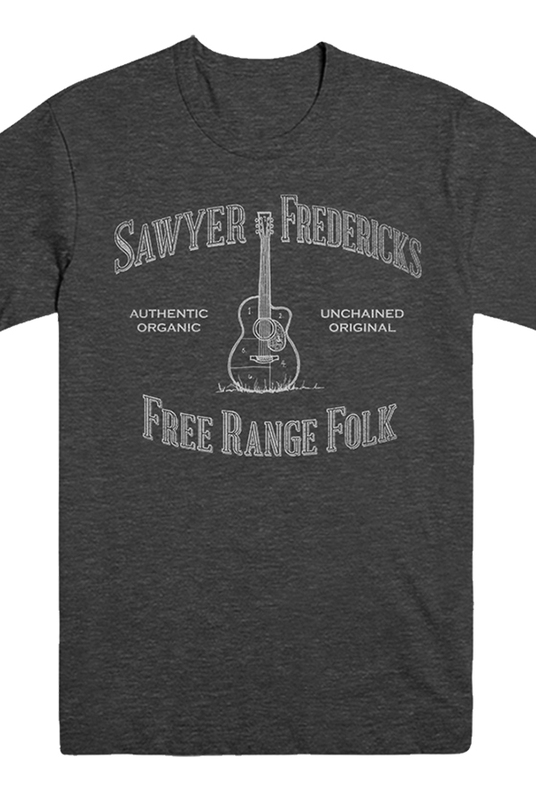 The new Free Range Folk design includes the new wording, "authentic, organic, unchained, original," while highlighting the now familiar phrase Free Range Folk, which represents both Sawyer's way of living and learning, as well as his border free genre. Sawyer's A Good Storm Free Range Folk Design Unisex T-shirts were hot sellers, so we are pleased to bring you this New version. 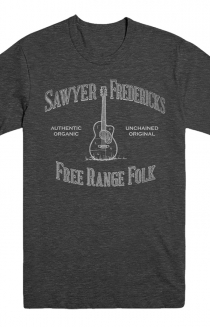 Sawyer's new Free Range Folk Design Unisex T-Shirt is being offered in our new color, Heathered Charcoal! This TriBlend T-Shirt is a 4.8 oz jersey knit, made from 50% Polyester, 37.5% cotton and 12.5% rayon. Sawyer's new Free Range Folk Design Unisex T-Shirt is soft, breathable and comfortable, and Made in the USA. Sawyer's Free Range Folk Design was crafted by Kirsten Fredericks.